Detective Gates was mortally wounded while responding to an unknown disturbance in an Ogden grocery store at 24th Street and Grant Avenue. 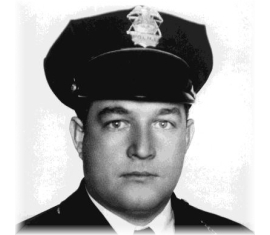 Unaware that the store was being robbed, Detective Gates was immediately fired upon as he entered. The wounded officer and the suspect exchanged gunfire. The suspect barricaded himself in the rear of the store, surrendering to other officers only after tear gas was thrown in. Detective Gates, 38, died minutes after arrival at the hospital. The suspect was tried, convicted, and executed by firing squad at Utah State Prison in 1943. Detective Gates left a wife and two children. He is buried in Ogden City Cemetery. His bronze name plaque is sponsored by Ogden City Corporation.